The Paglight LED and PowerArc Field Kits incorporate either the LED Dimmer unit or the PowerArc HMI unit, as well as two standard halogen lamp units, enabling you to take advantage of the unique plug-in lamp holder system which makes Paglight the world's most versatile camera light. The Field Kit is tailored to your requirements with a choice of Paglight Power Base and a choice of two halogen lamps (from 20W, 35W, 50W, 75W or 100W). The components are housed in a strong, lightweight and compact fitted flight case with space for additional Paglight accessories. A Paglight. H LED or PowerArc Conversion Filter. B Choice of Power Base. C Standard Lamp Holder (with choice of lamp). J Camera Clamp. D Standard Lamp Holder and protector (with choice of lamp). K Camera Shoe Plate. E LED Dimmer or PowerArc Unit (with arc lamp) and protector. L Stud adaptor. 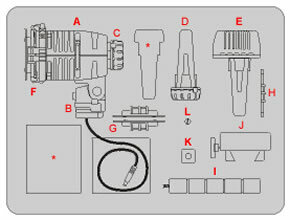 F Rotatable Accessory Kit. Comprising: accessory holder, 1 pair of parallel barn doors, 1 dichroic filter and 1 diffuser. * Storage space for additional components.